This ain’t your grandma’s recumbent bike. 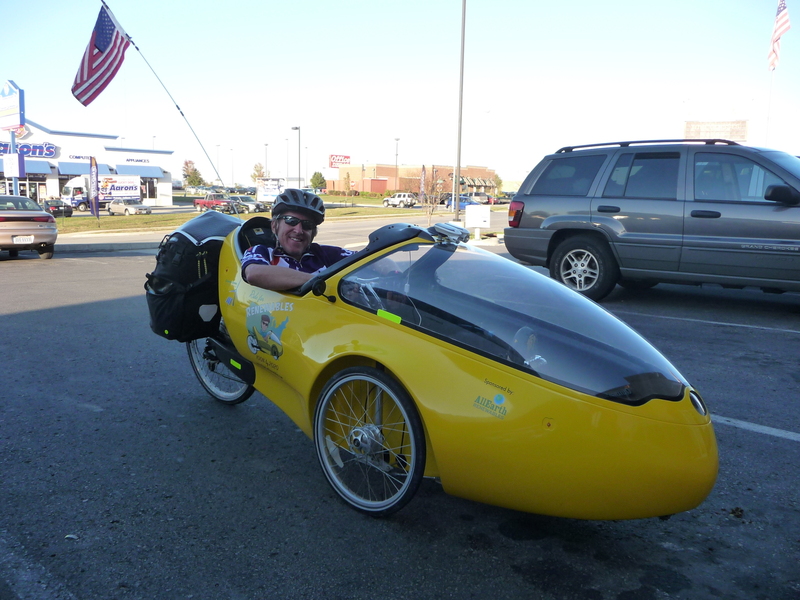 Commonly known as a velomobile, the “rocket trike” is a new concept in human-powered vehicles (a recumbent tricycle wrapped in a lightweight aerodynamic shell). I chose this particular Go-One³ model for my rides because it represents to me the creative potential of humans to do things differently. And it’s fun. The Go-One³ prototype was inspired by Michael Goretzky, whose flair for innovative design contributed to the development of Diamler Chrysler’s European SMART car. The German manufacturer, Beyss, has been advancing the design characteristics of its Go-One for over a decade. Enclosed in a light carbon fiber shell, my rocket trike weighs about 60 pounds, and includes a built-in windshield, luggage rack and carbon fiber rear wheel fork. On the flats, I’ve reached speeds of 20 mph, but typically average closer to 10 mph loaded down with gear. While much tougher pedaling uphill than an upright bike, it more than makes up for it by shooting downhill like, well, a rocket. Top recorded downhill speed: 40 mph. Other features include joy-stick steering, front drum brakes, ventilation inlet (it needs more of these), wheel housings that prevent water splashing, “Fred Flintstone” reverse mode (holes in the bottom for your feet) and a reclining seat comfortable enough to sit in all day long. My rocket trike has a fully-removable, roll-up canvas rag top for rainy days, but I usually ride convertible style. I’ve also added solar-powered headlights and a mounted, solar-charger for my iPhone. Registration and insurance are not required for rocket trikes. North America considers the Go-One³ a fully faired trike that is legal on all roads and bike paths, with bicycle rules applying. For more information on the Go-One³, check out: www.go-one.us.